Icewind Dale is a cold little place featured in many "Forgotten Realms" based novels, such as the "Icewind Dale Trilogy" by R.A. Salvatore, and now it stars in it's very own game! Icewind Dale uses the same engine (The Bioware Infinity Engine) used to create Baldur's Gate, a nd makes damned good use of it, too. The controls are quite easy to learn, even if you've never played Baldur's Gate before, and the storyline leaves nothing to be desired. You start off your adventure by creating a party of adventurers from 1 to 6 people. Your companions' races can be anything from Human to Half-Ogre, and their classes can be anything from an average fighter to a specialist mage. If you so choose, the multiplayer option allows you to join up with your friends or strangers to take on the 150 or so different monsters that roam the dale using a wide variety of weapons and spells. You explore many different areas, such as crypts full of the walking dead, volcanic caverns, and ice capped mountains. Icewind Dale is one of the largest games of its kind, and rest assured, it will leave you a lot less bored and a whole lot less pissed off than other certain multiplayer adventure/role playing games... Diablo II, for instance. If you liked Baldur's Gate... Hell, even if you hated it, or never even heard of it, check out Icewind Dale. If Drizzt Do'Urden lived there, it's gotta be good, right? Icewind Dale is a cold little place featured in many “Forgotten Realms” based novels, such as the “Icewind Dale Trilogy” by R.A. Salvatore, and now it stars in it’s very own game! Icewind Dale uses the same engine (The Bioware Infinity Engine) used to create Baldur’s Gate, a nd makes damned good use of it, too. The controls are quite easy to learn, even if you’ve never played Baldur’s Gate before, and the storyline leaves nothing to be desired. You start off your adventure by creating a party of adventurers from 1 to 6 people. Your companions’ races can be anything from Human to Half-Ogre, and their classes can be anything from an average fighter to a specialist mage. If you so choose, the multiplayer option allows you to join up with your friends or strangers to take on the 150 or so different monsters that roam the dale using a wide variety of weapons and spells. You explore many different areas, such as crypts full of the walking dead, volcanic caverns, and ice capped mountains. 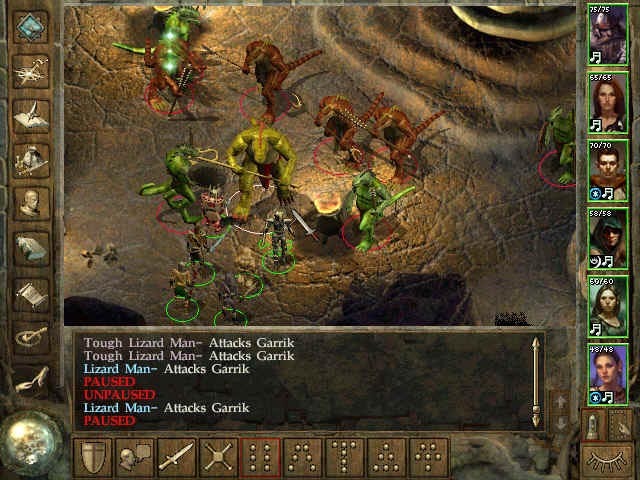 Icewind Dale is one of the largest games of its kind, and rest assured, it will leave you a lot less bored and a whole lot less pissed off than other certain multiplayer adventure/role playing games… Diablo II, for instance. If you liked Baldur’s Gate… Hell, even if you hated it, or never even heard of it, check out Icewind Dale. If Drizzt Do’Urden lived there, it’s gotta be good, right?